Well when you put it that way, it sounds a lot like an icon. Thus, mine is clearly the forget-me-not. Many options, but I think I'd end up with a tree - not certain which variety exactly, although when I think of iconic trees I default to things like oak. The key feature is that it mostly just hang about doing its tree thing, quietly soaking up sunlight and incidentally providing food and shelter for other animals - trees do also have a tendency to just kinda take it when the axes come out, but faced with an impenetrable stone wall that no unequipped animal could scratch, they're just all BRB ERODING AND UNDERMINING. I love the idea of creating an aggregation of symbols for all the important people and events in one's life - one of my favourite playwrights, TJ Dawe, had a show called Totem Figures that was about that idea, posing the question of what every person's own totem pole would look like if we kept stacking up the images of the people that shaped us. I love the idea of building a collection of the symbols one has assigned to people and events who mean a lot. Slightly more thought-through reaction? Something I'd put on a banner? Probably a swimming frog, with a scorpion on its back, tail raised. Well, you know, ideally I'd like something fierce and fearsome: a tiger rampant, facing to the dexter, or something like that. A friend of mine drew that for me, back when I was still doing martial arts and writing the sort of fantasy that has a lot of sword fights. If I were doing such a thing today, I might do an owl, volant, facing to the sinister above a courant fox facing the dexter. I don't know, a dragon or a unicorn or a duck or something. Very fond of angels as well. I might do an owl, volant, facing to the sinister above a courant fox facing the dexter. I do have a tattoo I want to get: this design, but probably in colors of green and yellow/gold rather than red and black. 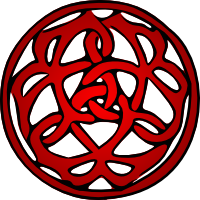 That's related, but making sideways nerdy references, and (especially with a palette swap) likely to be misread by a lot of people as "some Celtic knot thingy," which is not at all the point. One thing that I frequently hear (and dislike hearing -- see current and future Narnia posts about stereotyping people based on appearance) is "You don't seem like the kind of person to have a tattoo!" For a variety of upbringing reasons, "You don't seem like the kind of person" might still pop into my head in regards to tattoos, but for a variety of world-experience reasons, I now recognise that as a daft thought, and I have lots of daft thoughts, so I mostly concern myself with not saying them outloud. This practice generally serves me well. I'm vaguely interested in the idea of getting a tattoo myself - I have a friend who was saying the other day that the rule she's set for herself is that she has to get an idea and then still think it's a good idea two years later. I love symbols! Flags, particularly, but crests and emblems, etc, are cool, too. Having said that, I always have problems with questions like these in terms of not knowing how to answer. Honestly, I'm not sure what my symbol would be; I don't have the proper impartial perspective on myself to figure out whether it should be a positive or negative portrayal of me. Same for any 'describe yourself in one-three words thing. One of the many things I write is war fiction, though, so it helps to understand how powerful symbols and symbolism can be; see: flag raising, Iwo Jima on. You're never supposed to let the flag hit the ground, and if it does, you pick it up and carry it forward, in the same sort of way that soldiers would fight like hell to get to their fallen king and recover him instead of allowing him to fall into the enemy's hands. Stuff like that. (Completely unrelated note but OMG OMG, Sins of a Solar Empire's third major expansion pack, Rebellion, came out recently and I even more recently purchased it. Honestly, I'm not sure what my symbol would be; I don't have the proper impartial perspective on myself to figure out whether it should be a positive or negative portrayal of me. It seems to me that this is pretty much uncontrollable - you just try to portray yourself, and other people are going to read it in positive or negative ways based on a lot of things. You could go all-out trying to portray yourself in a negative way and someone could still like the way you think, even as they recognised you were aiming for self-critical. A symbol of myself? Let's see a hawk or an tawny owl or eagle owl. The bird would be sitting atop a branch of a maple tree. I wonder if that'll change over time - the symbols. As much as I always thought it'd be cool to have a tattoo, my slight phobia of needles has deterred me from trying. Though they definitely look cool on other people. Having them in coverable places is the main suggestion I've heard from all sorts of tattoo enthusiasts and experts. It's just... depressing when I think about all the various avenues for prejudice that exist in our society. There just seems to be such a plentiful supply of prejudice. I'd like to think that our species can eventually overcome all of that someday, but I suppose that's just hopeful thinking on my part. Though I can't help but try to fight against prejudice, discrimination, and various other forms of oppression in hopes that maybe, just maybe we can somehow overcome it. My thoughts are a bit all over the place today. That is such an epic opening cinematic. I've seriously thought about getting this game when I have funds to spare again. I've been wanting to play a Space strategy game for awhile now. Currently, I've been playing around with Endless Space, but that's entirely turn-based, and as fun as the game is - and as inventive it seems to be as well - sometimes real time strategy can be fun to tackle too. As for describing ourselves, I don't think there is a never-changing concrete answer people can give. I mean, how I describe myself ten years ago differs from how I describe myself today. The symbols are bound to be changeable too, which is why as much as the idea of crests and symbols of families are cool, I can't quite enjoy it because of the lack of change such symbols allow for. As humans, we are not quite static, and although a few aspects of ourselves may seem to be fairly solid, change is inevitable and who we are as a person may evolve over time. I know, for me, that's the source of my troubles with finding accurate ways to describe myself, especially in the formats of symbols or the "three words to describe yourself" formats. On the other hand, I've identified with the nickname Bird since I was a child, mostly due to my younger sister's justification. She pointed out that I'm fairly light (like a bird she claims), I sing (nicely and beautifully like a bird song), I create (like a bird building a new next), and I explore (like a bird migrating or flying to different places). As silly as that is, it does seem to sum up a few of the core aspects of myself that may evolve a bit, but never stray far from their origins. I'd like to think that we all have a core personality that changes little and acts as a stabilizing force to the constant change we often encounter in life. However, even with these core aspects of my personality, how they manifest seem to have changed over time. Thus, what type of bird I identify more with has also changed over time. A sleeping dragon. It would have to somehow communicate the idea that, while asleep now, if it were disturbed and awoken, it would have very little trouble crispyfying whatever disturbed it, were the reason insufficiently valid. I think that describes me well, and can be read both as a positive and a negative, which that behavior is for me. A platypus is weird. They are so strange they were assumed to be a hoax when the first stuffed specimens reached Britain. And platypuses have strange electroreceptive powers in their duck's bill with which they can perceive objects deep in muddy water. They lay eggs, feed their young with milk, and have poison claws which can cripple you. All of these are characteristics which please me. A compass rose superimposed on a clock face (2:35) surrounded by three masks: two Comedies at North and West, and a Tragedy at East. This would be tattooed on my left wrist, underneath where I wear my watch. My first reaction is to say an owl, but I don't really know all that much about owls. So I think I'd go with a tawny frogmouth (sort of south east Australia's owl equivalent) - they eat insects, and have these hairs above their beaks that, when touched, cause the reflex of them opening their mouths. When they're in a tree, they're incredibly hard to spot, because they look like a short branch. Very cool animals. I designed a personal sigil in high school, a stylized dragon, all simple lines. I'm not really the same person now that I was then, but the symbol still has a lot of meaning to me, so that's what I would use. I like tattoos a lot on other people (a good friend of mine is a tattoo artist), but I've never been super interested in getting one myself. (Incidentally, I gave my mother-in-law a turn the other day when I said that I wouldn't mind if my daughter got a tattoo.) If I did, though, I would get my dragon symbol, somewhere small and inconspicuous, probably all in black since it is really only a line drawing. When I was in high school or college, I would have picked a dragon. That's just because I was enamored of dragons, more than a personal statement. I would probably pick a cat of some kind, now. I'm a cat person, cats like me, and I find my personality is somewhat cat-like. maybe one eye open? that could be kind of menacing I think. I love personally-significant symbols of oneself, but mine have tended to be words. Words can be changed or discarded for something new; tattoos, not so much. All the names I go by have layers of meaning, which usually include imagery. I have had symbols arise in works of art I created that I wasn't consciously thinking about. They've often been more interesting than things I *was* consciously trying for. For myself, I don't know. An amaryllis would in fact be unsuitable. Maybe a lilac cluster or a bayberry branch. Or a piping plover. I'd have a sleeping tabby cat next to an open book with a stylus and crochet hook crossed below it. I love cats and have tamed ferals, write, and do textile thingies. I'm thinking of getting a primitive tattoo when I happen to be in the same place as the girl who makes them. Three horizontal lines on the neck, over the spine, like water. I would like another meaningful one, too, but I'm not sure what it should be. True, one eye open would be menacing, but that has implications that don't work for me, like that I'm always on my guard against creatures our heroes looking to steal my hide. No, this is supposed to be more like "never tickle a sleeping dragon" - it takes a bit to get me riled or to convince me that you have bad intentions for me, but one that's established, then there's very little, short of a complete destruction or a very bad scalding and roasting, that will lessen the grudge or the bad opinion I have of you. Something that can imply "drama-free by choice" and "don't screw with me unless you want eternal emnity" in that order, yet together. Hmmm. Being an SCA person I have a coat of arms. It's got geckos displayed and eight-pointed stars, and they are blue, kinda between turquoise and electric blue, field is silver/white. I'm big into geckos, the little ones that run on the walls, which remind me fondly of childhood moments in Thailand. And I spent many years in deserts where lizards come and go. And blue is my very favoritest of colors, and that electric blue of the high desert sky after night falls...is...just...yeah. It's related to a conversation I had with my confirmation mentor about imagery of the Divine, and a gift she gave me. If we're just talking personal animals, it'd be the otter. If we're talking more of a sigil or something to get tattooed, it's a feathered dragon wrapped around a key (I've made the design, now for the tatoo!) somehow, I'm sure that can be turned into a heraldic shield of sorts. What if you had it fully asleep, but with smoking nostrils? Or just some clearly sharp claws? I think as long as you don't go out of your way to avoid it, you shouldn't have much trouble getting "is dangerous" out of a dragon, even if it is asleep. That might work, yes. Something gleamy or shiny that draws the eye to the natural weaponry. Maybe paired with an expression that would think the dragon, even asleep, is going to cause destruction. I wouldn't know hwo t otranslate that into a piece of art, but thanks for the suggestions on how to get the idea across, at least, if someone who did arts were willing to draw it for me. I'm a great fan of snakes and serpent-things that resemble snakes (Chinese dragons and Quetzalcoatl, mainly), in no small part because a snake can be easily turned into a variety of knot patterns. Not that I'd actually adorn myself with a Chinese-dragon-Quetzalcoatl hybrid twisted into a celtic knot, mind you. That has way too much potential to turn silly, especially since I can only claim descent from one of the three cultures being referenced. A swimming bacterium along with something about opposing forces in balance (scales, maybe?). The reference is to the way bacteria swim toward food sources: not directly and purposefully, since that fundamentally doesn't work at that size scale, but simply by tweaking how often they change direction if they sense they're getting warmer or cooler. Because I keep having to remind myself to approach life this way: it is less important to do the correct thing every time and more important to tilt the field so that, in aggregate, I end up doing the correct thing. I've thought about henna-ing this onto myself and renewing it whenever it fades, since I don't want to commit to a permanent tattoo yet. A yin-yang with two swimming bacteria as the eyes, perhaps? Heh, yeah, both positive and negative applies to "scorpion riding swimming frog," I think.